If Santa had a KPI dashboard, what metrics would he be watching? Track Santa's progress on Google maps or on Google Earth. Follow Santa on Twitter at @noradsanta. Shopping? Search "santa" on you mobile phone's Google maps app. Thanks NORAD! -Are there feeder sleighs for rapid resupply? -Flexible factory for last-minute changes to mix? -Is there a process for missed deliveries? -Does he take cookies home to gain-share with the workforce? -Has Santa ever applied for a Shingo Prize or Baldrige Award? If anyone has made a site visit and can answer these questions, we want to hear from you! My last post, Toyota's workplace safety philosophy is part of sustainability, and this one will look at how that plays out in Europe. In 2010, Toyota Motor Europe created a Safety Promotion Committee made up of representatives from senior management that will set direction on safety throughout European operations. Safety improvements are made at other workplaces besides factories. 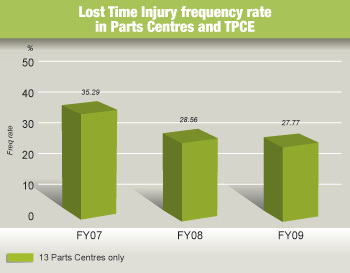 For instance, parts centers, logistics, and offices had their share of improvements. In the parts centers, the global strategy to reduce STOP 6 accidents (see the previous post) resulted in a significant improvement. 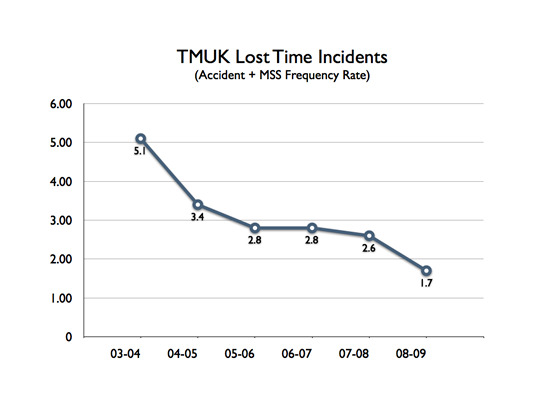 New STOP 6 risk assessment tools and check sheets revealed improvements that reduced risk. There was also a focus on separating human work and machine work, avoiding falls from heights, and developing a safety awareness plan. The vehicle logistics group worked with rail partners to prevent falls during rail transport. People must be able to get on the top of the rail transport units, but fixed safety barriers would not fit under bridges. Working with our rail logistics partners, the vehicle logistics team came up with a system of adjustable barriers. Facilities including offices, garages, workshops, and laboratories in Brussels and Zaventem, Belgium established a system for risk assessment system of chemical products from purchase to disposal. * Ergonomic injuries are reported separately from FY09, previously they were integrated into these statistics. 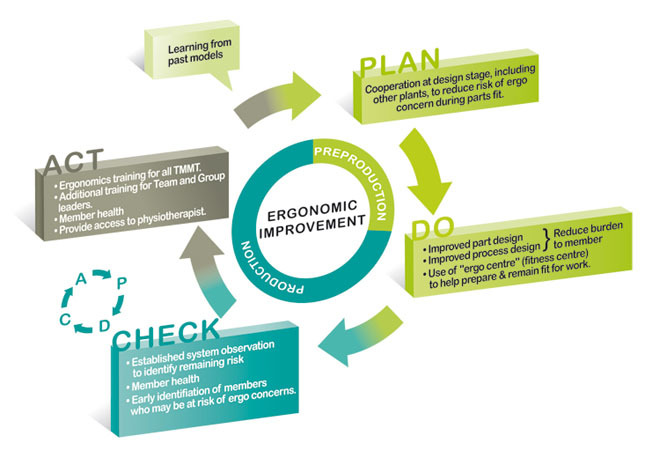 Throughout the European organization, an Ergonomics Working Group (EWG) of safety specialists share best practices, working with the Safety Working Group. Daily pre-shift meetings make safety the first agenda item. Depending on their jobs, people go through some physical exercises to warm up and avoid injury. In addition safety checks are carried out on equipment. The attention is on safe processes and equipment, safety kaizen, and training and confirmation. To help employees develop a “safety mind,” hazard awareness training is provided. 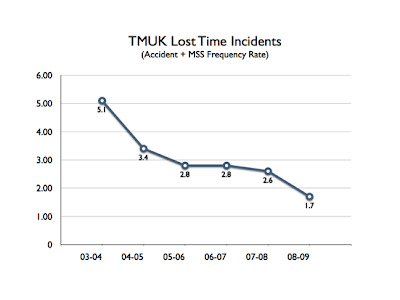 Near miss reporting also triggers safety interventions. Following genchi-genbutsu -- go, look and study -- senior management can spot safety related issues and raise awareness of health and safety issues. Using the Plan-Do-Check-Act cycle approach, Toyota Motor Manufacturing Turkey’s (TMMT) started production of the new Auris with extra improvements. 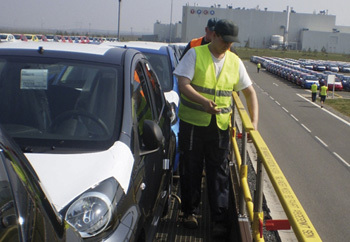 The importance of employee communication in identifying and reducing risks was the focus of Toyota Motor Industries Poland (TMIP)'s annual safety month. They even stopped production to find improvements. So far, more than 80% of improvement points have been addressed. Reportedly, 70% of employees said they would like to do it again. A more robust system for employee safety suggestions is in the works. Toyota's strategy of having each workplace drive improved safety, described in my previous post, can be seen in the differing details of safety improvement in Europe. The overall goal for each is zero accidents and injuries. 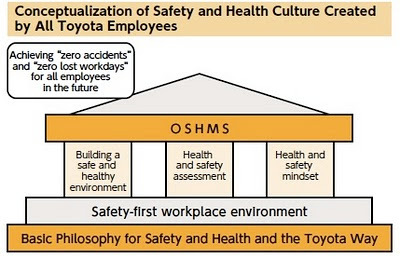 As everyone knows, Toyota's been hard at work reducing vehicle safety risks, but it has also continued to emphasize safety improvement in its workplaces. “Safe work is ‘the door’ to all work. Let us pass through this door,” Eiji Toyoda was quoted as saying in the 2010 Toyota Corporate Sustainability Report (CSR). The report stresses that Toyota’s fundamental belief is that safety is essential for sustaining and developing the company, and that placing safety first is everyone's responsibility, from senior executives to every employee at the workplace. To Toyota it is a universal value that is “unaffected by the times.” Furthermore, Toyota believes that no employee or team member should be put at risk of suffering a work-related accident. Beginning in FY2008, the approach has been “building a culture that enables all employees/team members to think for themselves and practice safety and health.” Each workplace is to be a driving force behind a company-wide effort. 3. Creating a structure for global implementation. 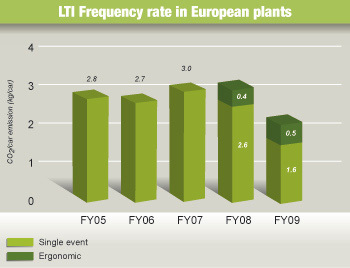 Through this workplace-driven approach, total accidents decreased by about 16% over the previous year, the number of lost workday cases decreased by 35%, and the number of STOP6-type accidents decreased by 14%. Its Occupational Safety and Health Management System (OSHMS) promotes safety and health activities. Emphasis on basic rule observance and interdependent bottom-up initiatives involving the whole company will be implemented in FY 2010. The aim is that when all employees understand the benefits of an interdependent safety culture, they will make progress toward achieving and maintaining zero industrial accidents at each workplace.